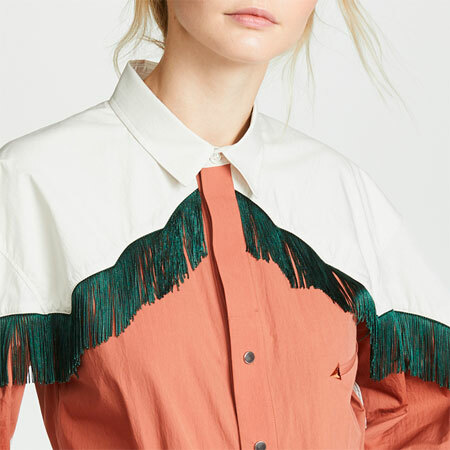 The Nordstrom Anniversary Sale is my favourite sale of the year. Hands down. Yes, Nordstrom is an advertiser here on YLF, but this has nothing to do with my love for the NAS. The thing that makes the Nordies sale so special is that unlike most end-of-season sales that mark down old merchandise, the NAS marks down “hot off the fashion press” merchandise from the upcoming season. It makes for a uniquely exciting sale experience. It also makes for an incredibly busy few weeks. Many of my clients want to take advantage of the NAS so I spend lots of time with them combing through the Fall ranges and putting together their important capsules. Wednesday was the first day of “preselection”, where Nordies account holders can get an early look at the range and pick out items before the actual sale begins. Between shopping for myself, familiarizing myself with the sale merchandise, and working with two clients, I spent 14 hours on my feet on the first day of NAS preselections. We also do a lot of NAS coverage here at YLF. There is my top picks post, which I publish as soon as the sale merchandise is available online to all (July 20). That means waiting until after midnight for the site to go live and then spending a couple of hours matching items from my notes with the online range and putting the post together. This year Nordstrom has asked me to do some outfit builder posts using items from the NAS range, and we will publish these posts when the sale is open to the public. We hope that you enjoy the NAS coverage. We do know that lots of our readers aren’t in the USA and can’t participate in the sale itself, but I will try to make the coverage useful nonetheless. This post has some pictures from my first day at the NAS. The ones above are a small glimpse of what’s available on sale (the tip of the iceberg), while the ones below show what I ended up purchasing. The sale is definitely my biggest single wardrobe expenditure of the year, and I set a strict budget for my NAS indulgences. I shop the sale with a clear idea of my style goals and wardrobe capsules, but I also take the opportunity to try something new. 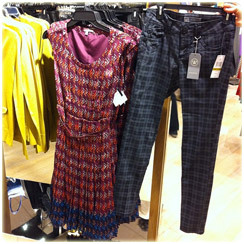 For example, I’m still into trousers, masculine inspired styles, and bright colours. But I unexpectedly added a blush pink leather jacket into the mix and built onto that capsule. If Autumn and Winter are your dominant seasons, or if you live in a four season climate, the NAS is a great opportunity to get statement pieces and good basics. This is my seventh NAS and each year I love my items even more than the year before. By the way, I am using Instagram to take quick snapshots, so if you use the service you can follow ‘youlookfab’ to see these photos in realtime as I take them. I will also tweet them so you can see them if you follow me, @youlookfab, on Twitter. …living vicariously through Angie (again)…. I’ll have to make it to the US one year for this. The Michael Kors sheath with the zipper pockets and leather short sleeves and trim is so far my favorite piece of the sale. I convinced my skinny petite friend to get it, it was perfect for her shape. I am also excited to see Sejour has colorful pencil skirts for plus size like those amazing Halogen ones of the last few years. I snapped one up for myself in purple. 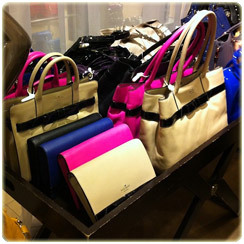 Definitely going back to check out the bags and shoes; that Kate Spade one you snapped looks amazing! I never realized the Nordstorm sale in the warmer months was actually NEW fall merchandise until I started reading YLF. 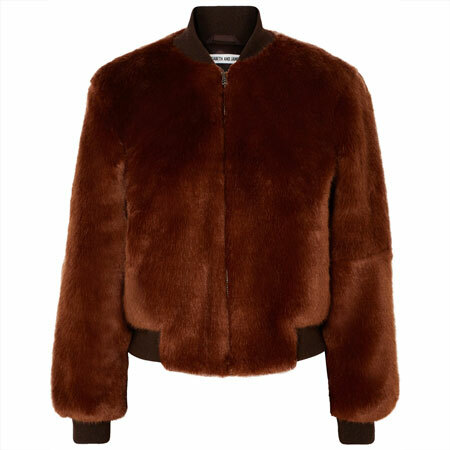 Now ever year I eagerly await NAS and the top picks list to help me with my colder month wardrobe capsules. I can’t wait to see this year’s items in person! Of course, just when I start my promise to myself to make no fashion purchases until Saptember. I will be strong! Angie, it is amazing how I can look at what you picked and see each piece on you perfectly. That blush moto will be stunning on you! Fabulous coverage as usual Angie – the items all look lovely and are making me drool from over the border! And your personal items look positively DELICOUS!!! Looking forward to seeing you rock that blush pink leather jacket! You might want to keep a few napkins handy when you take that bag out for a walk — there will be random strangers drooling over it otherwise! :-p And it matches your belt, doesn’t it! Love that geometric print scarf too — and everyone loves the houndstooth blouse I think! Loving that Kate Spade bag. 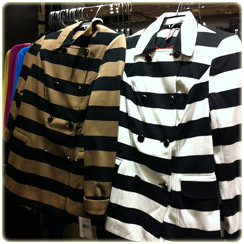 Those striped coats are are amazing. Have you seen them on anyone yet? You are also amazing for doing this for all of us! Take care of yourself during this busy time! that 5.4 on the Richter that the USGS just reported was me hitting the floor – splat – after seeing that blush leather jacket! OMG Angie i cannot WAIT to see this on you!! I love the hint of styling you have in the picture with the chiffon scarf and dusky blue/lime geo piece. But i’m thinking doing a bit of tonal colour blocking with tomato red would be insanely gorgeous and totally unexpected as well!!!! Wear it NOW! don’t have a nordies card, don’t have much of a clothing budget anyhoo so i have to sit this one out. I do enjoy the NAS coverage and members’ comments as it lets me know what’s coming up fashion-wise, and i am fascinated by people’s choices in shopping and in building their wardrobes. however, i have been able to implement a long-standing philosphy of mine this year – to strike while the iron is hot! i love bright, ‘sour’ and ‘off’ colours (tangerine, lime, citron, green apple, etc.) but it is the rare year when they are produced. Now they are plentiful, and i have managed to get lengths of orange/tangerine in a coton/silk and in a rayon spandex jersey (a watercolor abstract floral print with white). I got a length of coton voile in beautiful violet/blue (new color to me) and have my eye on a couple of additional fabrics – citron (an italian jersey blend), apple green (coton voile), sour/spoiled apple in coton/silk. Exciting! I can’t wait to see the blush jacket in action. I don’t plan on making a ton of purchases at NAS, since I’m pretty set for fall, although I’m not ruling out the possibility of picking up one or two items that really light my fire. I am enjoying living vicariously through all of you though! I am THRILLED to say I got a teaching job in the Seattle area and will be back in Seattle just in time for the NAS! YOU DO NOT EVEN KNOW HOW EXCITED THIS MAKES ME! Angie, I have so enjoyed checking out your twitter page as you preselect at NAS for yourself and your clients. I’ve made a few purchases, but am approaching NAS a bit more cautiously this year than in years past (and of course am doing it all online). I can’t wait to learn the origin of that purple boxy sweater, as I can’t seem to find it anywhere in the online selections ; ). So fun! NAS is such an energetic time on the YLF forum too. You can absolutely feel and see the excitement. Employees can’t shop until the first day of the sale, but I have my shopping cart full of items I want to try. I hope my selections are still available on the 20th! (Very nervous!) Meanwhile I am enjoying watching others having fun shopping. I knew you would buy that yellow coat the moment I saw it! I thought to myself: “Angie’s going to buy this for sure!” and you did. Ooh, what beautiful things! 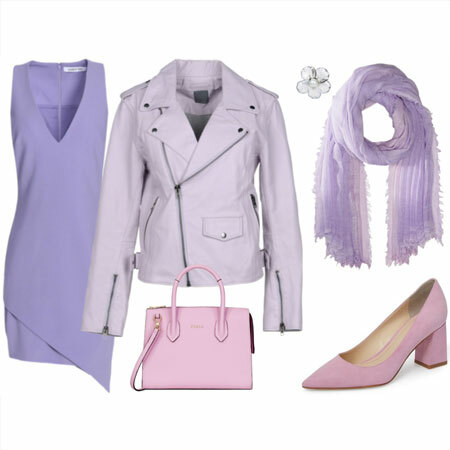 It looks like you found a lot of great items for your wardrobe! I so appreciate the tremendous effort you go to in covering the sale and creating a list of “highlights” for us!. Even though geography prevents me from shopping at Nordies – I study your lists very carefully anaylsing the style elements…and search for comparable items closer to home. Thank you Angie! love the tops you chose, and those striped blazers have appeal….gap had some of the latter early in the summer, but they disappeared before i could make up my mind! still love the equipment animal print silk blouse you inspired me to purchase last yr. (although the seams have needed repair—take note equipment) at the sale. Lovely picks! 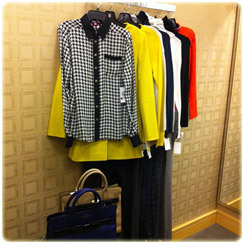 I especially love the houndstooth blouse, python booties, blue bag, yellow jacket, and blush moto! But I can’t believe that after 7 years of NAS that you are still buying things like solid color sweaters…I would have thought you already had basics like that in your wardrobe? Are you just replacing worn out items? I must have overdid it last year. It’s only my second year at NAS and I am already limited by the things I can buy, since I already have two leather jackets, four pairs of boots, lots of coats, etc. I’m only looking for special statement pieces or nice loungewear to fill my casual wardrobe holes. FUN!! That blush leather jacket is killing me! (In a good way, of course!) 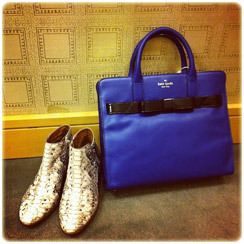 And I love the blue KS bag in the last photo! Big fun!! Angie, this is all so exciting! I was just explaining to DH that your coverage of the NAS is like the Superbowl coverage. I told him the pre-selections were even like the pre-game, lol! And being on your feet so long the first day surely made it an athletic event (who needs a gym girls, let’s just go shopping)! I for one enjoy the NAS coverage, even though like Steph, I can’t really participate. I appreciate your eye Angie and how you sort through everything to show us the best of the best. It’s nice to see what colors and cuts have filtered down from the runways, even the type of buttons on the coats. I find your work very helpful as I start assimilating all this information for use later, to be tailored to my climate and price point. Thank you for enduring the sleep deprivation and long hours to bring us all of your fab picks! Love the coverage, Angie. I learn so much by seeing your picks. I can’t wait for 7/20! Angie…I eagerly anticipate your NAS coverage every year! This year was the first time that I had a card and did the pre-select. It was a bit overwhelming and I only spent a few hours of one day there…so I can only imagine how grueling it must be on you! Take breaks and sit down once in a while, and stay hydrated and fed. Good luck, and thank you *so* much for your NAS news! Thank you, Angie! Your delightful zest shines through in all the pieces you chose, and we so appreciate your helpful intel. Rock the moto, and while you’re at it, the casbah. And the minute I saw that houndstooth blouse, I thought you might get it. Looking forward to seeing how you incorporate all of your new goodies! I’d never heard about NAS before this year. I love to see your pictures and can’t wait to see your picks, although it would be difficult to participate. Seeing what you pick also helps me to know what to look for when I’m shopping up here in Canada. It’s all pretty exciting! I’m tempted to get those python flat boots, but I can’t picture myself in them, which is weird… Anyway, I’m looking forward to your picks and reports. I love this coverage. But big department stores overwhelm me. I find it really hard to see the trees for the forest, if you know what I mean. This weekend I have to pick up some shoes being stretched at Nordstrom and intend to hit the NAS then. Anyone here live in a warm climate like southern California? If so do you shop this sale and if so what kind of things do you pick up? I’m still getting used to this climate and am woefully lacking in transitional clothing for our hot summer to merge into an equally hot fall. Thanks! You’ve snatched up some beauties to add to your closet. I can’t wait to see you in the blush jacket, I bet it’s gorgeous with your coloring. On pins and needles waiting for your picks list! Thanks for the excitement ladies! Marianna, we will be houndstooth blouse twins! And we have always loved and worn the same colours. Goldenpig, knitwear does not last so I am always replenishing it. Also the colours this season are SO ME. I need to stock up now. Furthermore, I love simple basic pieces – the classics. They make everything else that I wear look better. The best support act ever. Steph! You crack me up. Hugs and happy sewing! Look at all that CITRON! F/W is not my dominant season, so I usually try to stay away, but I’m now practically frothing at the mouth to see the picks post. I applied for a Nordstrom card last night by phone, just so I could browse the online pre-sale… I haven’t been able to get those snake-print booties off my mind since I saw your Twitter post, and then I saw that they were nearly sold out (but still stocked in my size!). The boots were a splurge for me, and the only thing I’ve bought so far; can’t take inspiration from your styling! Took my two older girls on Wednesday, this afternoon it is my turn! 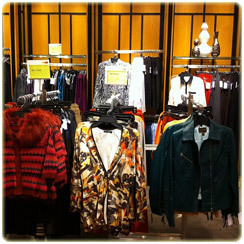 This year I am working with a Nordstrom stylist to help with my selections and fit. I am moving my wardrobe from SAHM to more MOTG (my twins are now 3 and can wash their own hands, sometimes). I plan on adding classic pieces along with some trendy items. I have my eye on some Rag and Bone colored denim and top, classic flats, silk tops (one polka dot) and possibly a coat (not black) for our typical damp Seattle weather. Plus workout gear for my active lifestyle. YLF has taught me how to mix my love for a neutral palette with statement pieces and/or brightly colored scarves and jewelry. I am excited to see what I find. Angie, it is such a treat to see your NAS coverage starting at pre-sale even if your recommended picks are not published yet. To have a glimpse of your NAS selections for yourself and your clients is a cherry on top for sure! I am faithfully follow your running commentary on twitter as well, great staff! Please have a lot of snacks and tea on these stressful buzy days to keep you going! Angie, thank you SO MUCH for your amazing NAS coverage! You’re really outdoing yourself. Not only do you spend 14 hours on your feet on the first day (and I’m sure almost as much on the days after!! ), you also take the time to post sooooo much online. I love your Twitter pics and all the comments you post on various threads etc. Soooo helpful. Thank you thank you. Oh, this is so much fun!! I love the live coverage! The Twitter pics are the best because those are the real selections made for real people and help me to ‘see’ items I’d probably gloss right over. I’m stopping at my Nordies in a few days, to wander and take it all in (the stylist there knows I prefer to shop alone and I can always ask her if I need something!). Angie, thank you so much for posting and tweeting in the midst of NAS craziness. I’m loving that yellow top you’ve posted (and I think it was one of your client picks too). Is it this one? Anyone on the forum, if you’ve seen this yellow/citron top, let me know because my sour color-loving self needs it. Thanks in advance! I logged on to the pre-sale on Wednesday morning (well, more like Wednesday afternoon as the site was down–NOT good, Nordstrom!) and I have to say, after scanning all the shoes and clothes on NAS, not a single thing caught my eye! In fact, I had an appt with a PS at my local store that night but postponed it because I just wasn’t feeling excited. Just seeing your shots of things is helpful and I’ve re-booked an appt to go in tomorrow. Anyway, hopefully I’ll see some items calling my name tomorrow, though given the upcoming wedding (1 month away!!) justifying fall shopping is a little difficult! Thanks Angie! Looking at everything makes me wish we had more a fall/winter where I live. Thanks for sharing and for all your hard work. 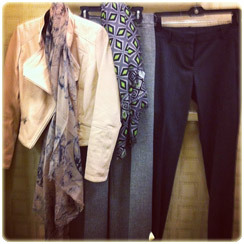 Wow I love what you purchased especially the blush leather jacket and mens inspired trousers and booties. Also the Kate Spade bag. You really have a way of getting through all of the merchandise and going straight for what you want. Amazing. I can not tell you how much I love the idea of pre-selecting. Sales shopping but organised; instead of queues, appointments. No mess, just order. Shopping heaven IMO. Angie, I know that your week has been nuts, but thank you so much for sharing all that you’ve seen and found. It’s been so much fun. I just returned from my NAS appt., and I think I did pretty well. I did a lot of homework beforehand, so that helped me focus quite a bit. Sylvie — I saw the yellow top at your link today, and it is a luscious bright shade. I loved it! Oh! NAS coverage from the preselections. What a treat! It’s wonderful to get this look behind the scenes -feels like we are there with you – and the merchandise looks positively drool-worthy. Setting up such a sale must be a huge endeavour, and everything looks so organized and not messy (I see RoseandJoan noticed this too). It must be a pleasure to shop at your Nordies. All the goodies you brought home are beyond stunning, Angie. Like many others I’m a big fan of the blush pink leather jacket, and it’s great to see how you are building a capsule around it. And I too want to thank you for all the NAS sharing. Your list of recommendations alone will keep you busy for hours, you’ve hardly had time to sit down since the preselections began, yet you take time to tweet throughout the day – so helpful and interesting to see your clients’ selections – and reply to our questions. Hats off! Angie, your coverage of the NAS is SO fun! I’m excited seeing all the pictures. Your blush/pink jacket is divine and with the scarves and the trousers, wow. You make it all understandable and accessible and so fun! I see plaid pants!! After the inspiration of your plaids, Angie, I ordered some skinnies at ASOS. So glad they are still hot next season. NAS is my favorite time of year on YLF. The Superbowl analogy is right on! Add me to those who are frothing at the mouth waiting to see your picks. I’ve already done a round of purchases and returns, but I know you will unearth magical items I never noticed. Until then, happy continued NAS shopping with your clients! Tons of thanks for taking the time to keep YLF fans up to date and for posting photos of your purchases. I need several items this year from the NAS sale, which may tie up most of my funds for the remainder of the year, but my outfits will be close to complete. Although I don’t look a thing like you, Angie, I love the same colors, shapes, style you do and I pattern so many of my looks after the photos you post. After briefly looking on the NAS website and catalog, I’ve found the great houndstooth blouse, which thrilled me that it comes in petite!, and the fantastic Kate Spade handbag, but I’m a little baffled by what looks like crew neck sweaters on your post. 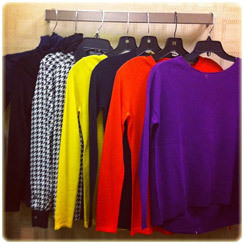 Are these bright color, long sleeve tops sweaters or the Caslon tees? Also the beautiful scarves you posted; Nordstrom website posts the geometric scarf in gray, teal, fushia-purple, but not lavender. Is the difference here the difference between photo, which is in the dressing room!, and the Nordstrom post? Love the pants—-are they straight leg? Thanks, again, for keeping us up to date. It really helps us out. 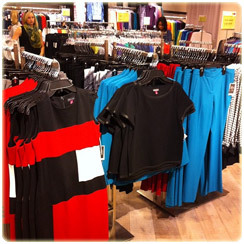 Thanks for this peek at your personal selections, Angie! It’s my favorite sale, too, for the reasons you mention. Since joining YLF I look forward to seeing your recommendations. I like the Superbowl analogy. This is the kind of sports event that I can appreciate! I am so happy to see that booties are still IN!! I am so excited to see you in that blush moto, Angie! It seems like a much softer look than usual for you. I love reading about your shopping strategy and can’t wait to hear more about the rationale behind these pieces. Looks like you replicated a top in your signature colors? Must be a fab one! I am heading up to Cincinnati this morning–thank you for the heads up!! 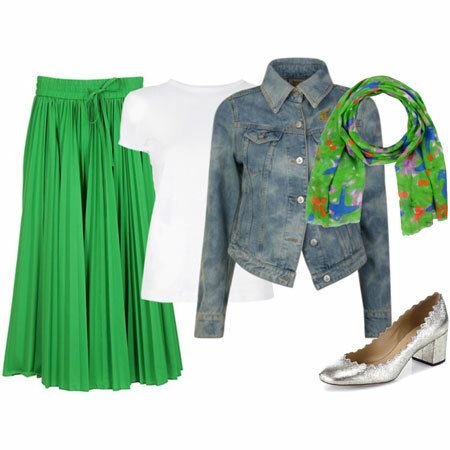 I have been trying my versions of some of your outfits–beaucoup de compliments!! thanks. TO say nothing of the ” don’t you look nice, from perfect strangers! !” It is making my day. The J.Crew Leopard print skirt arrived yesterday–I will need to wait until it cools down in my part of the world to wear it. My denim jacket and my great white shirt!! THank you so much. Gorgeous pictures Angie! While i don’t participate in the NAS sale i do enjoy looking at the goodies! It’s a pleasure, ladies. I had to chuckle at the Superbowl analogy. It’s been fun to follow the NAS preselection purchases on the forum this week! Holly, why are you baffled to see my crew neck sweater purchases? They are indeed pullovers and not tees. I do not wear t-shirt unless I am sleeping in them :). Angie, I’m nodding as I look at these pieces, but particularly the houndstooth blouse, the purple sweater (this is the one that’s higher in front and has that long zipper down the back, right? BEAUTIFUL piece of knitwear), the jacket, booties, and particularly that delicious Kate Spade bag. Also, I want to thank you again for taking the time to give us those excellent sneak peek photos during your first marathon day shopping with clients. It was so exciting and helpful to get a preview of what was available! The actual experience didn’t disappoint. Oh, I’m having so much fun watching everyone shop. I haven’t made it over to the sale yet myself. I know that’s so rookie of me. Thanks for your coverage, Angie. I enjoyed the forum posts, too. Fun! I also plan on enjoying the coverage. Will NAS items be available t purchase online on July 20? Will things go fast? And if yes, what is return policy like — I arrive in the US the first week of August so conceivable order/ try on and return. Would this approach work or is it crazy? Mirp: NAS items are available to purchase for everyone on July 20. Until then, the early access is open to cardholders. I’m sure there will still be plenty of items in stock on July 20, as there was last year when the sale opened to the public – it’s just that some specific items that are very popular can sell out more quickly than others, especially in sizes at the upper or lower end of the size range. But for the most part, there should still be a very wide variety of items available. Nordstrom probably has the most liberal return policy I’ve ever encountered. They will take your returns back no problem. Nordstrom Rack (the outlet store) is the only Nordstrom store that imposes a time limit on returns. Angie, If only I would ever stop & think before I type:-( Geesh! Of course you would place sweaters, rather than tees, in your cart since you have often mentioned you get cold up there in Seattle! I’m in Indiana and our weather varies from day to day. Plus, being in my 60s, I seem to become warm rather than cold, so tee shirt weight shirt makes more sense for me. And finally, we have the high/low style sense with you being on the high end, never wearing tee shirts, and I’m on the other end where I seem to wear tee shirts all the time. Your twitters & posts about the NAS are extremely helpful to those of us on that lower-end sense of style! No worries, Holly :). It was 84 degrees outside when I bought my NAS stuff last week, but that did not stop me from purchasing knitwear! I hope that you find fab stuff at the sale. Well I spent about 3.5 hours with my personal stylist on Saturday. She was lovely and quickly assessed my style and preferences and we took a TON of stuff into the dressing room. (Una, sounds like we had similar experiences.) I tried everything on but really just wasn’t super excited about anything. The article of clothing I liked best (and got) was a raspberry cashmere cardigan by Equipment that, of course, wasn’t even part of NAS! I also fell for these Prada loafers–not on NAS, no surprise. Got them and will wear them around on carpet to determine comfort factor before deciding whether to keep. I’m not sure whether I missed out on a lot of good stuff by going to the pre-selection 5 days after it started or whether I’m just not yet in a mindset to purchase fall merchandise or (most likely) whether this season’s silhouettes aren’t to my liking. I was hoping to possibly pick up a Theory pantsuit but was disappointed by the selection. Hate to be a Debbie Downer here, but wanted to share my experience. One interesting note: at the end, my PS and I swept through the men’s selections and I felt there was MUCH more offered. Even online, there are 50+ sportcoats/blazers offered for men, but very few for women. Sigh. Angie, your early coverage of the NAS is most impressive. Thank you very much! 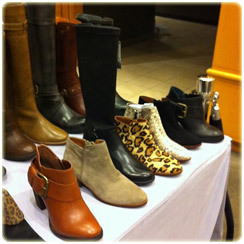 Like many people on YLF, I fell for those patterned booties the moment I saw them. Hee, this is hilarious. I’m sending virtual refreshments and tasty snacks. The Superbowl comparison is right on and it cracks me up. So true. I must say that the selection at our local Nordie’s was downright pitiful. I came, I saw, I left empty-handed. I would’ve been all over that jacket. Kari thanks for the through answer. Auburn thanks for letting me know variety may not be there — as a blazer is eactly what I’m looking for. Our local Nordies (Indianapolis) selection seemed pretty slim to me. Tents in each area were very small. I never could locate the 2 bags Angie showed in the photos of items she purchased; does anyone know their brand? 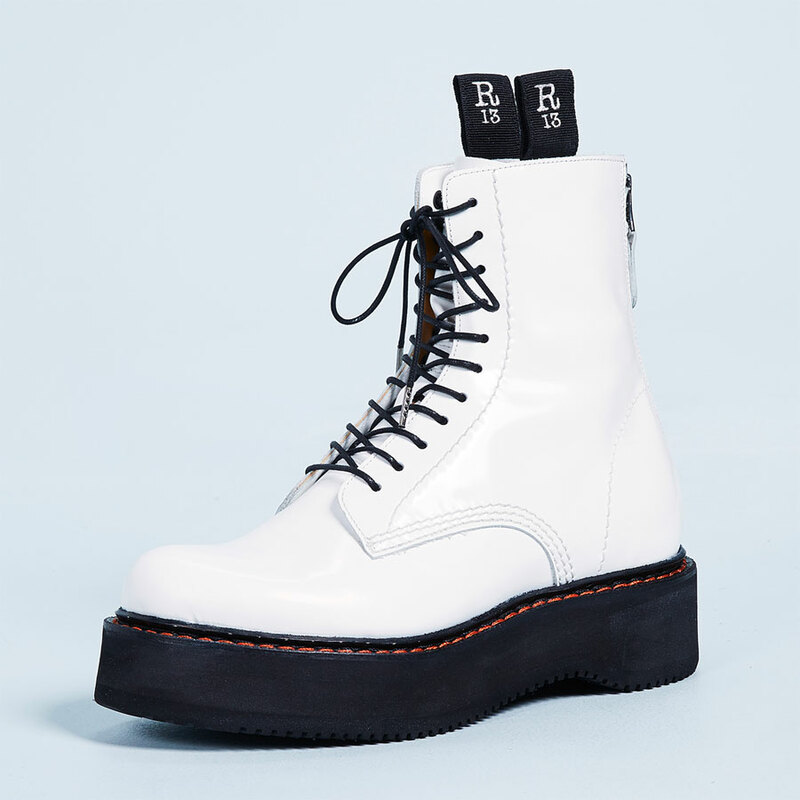 Just an FYI, a shoe clerk placed an order in my size for ‘Angie’s’ python booties but she said she now has to wait to place the order for the boots until the 1st day of the sale. As I recall, in past years, if an item sold out during the pre-sale time, it sold out. Our Nordies mentioned t o me, the company is placing some of the catalog items ‘on hold’ until the first full day of the sale so more shoppers have a chance at buying some of the catalog items. Interesting….. Good luck everyone!